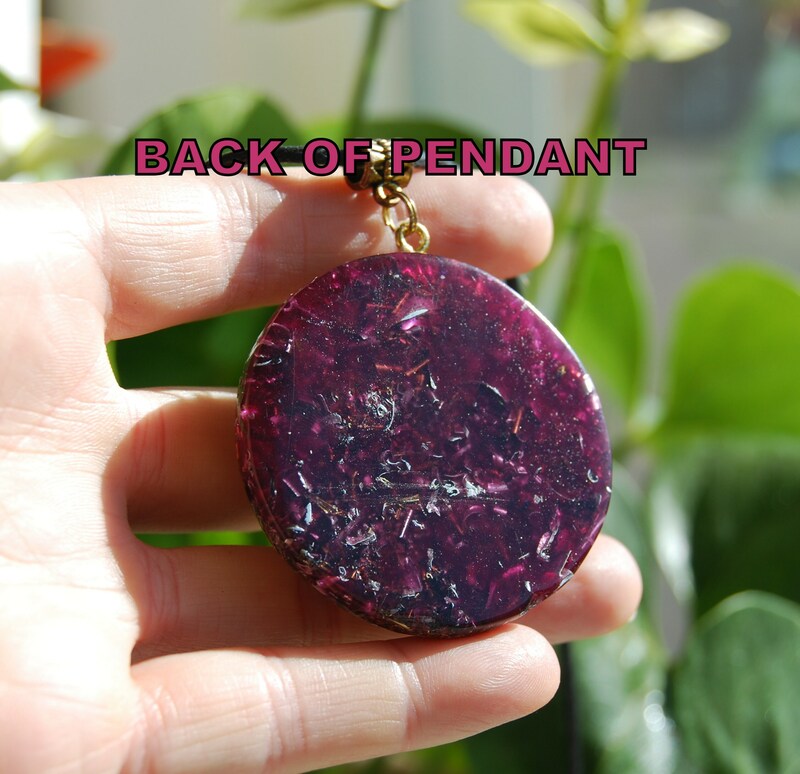 This lovely 4.7 cm / 1.85" in diameter Orgonite® pendant is made out of lots of brass, aluminium, bronze and copper shavings and 24K leaf Gold. According to Wilhem Reich's research lots of metal shavings are neccessary to remove stagnant energy. 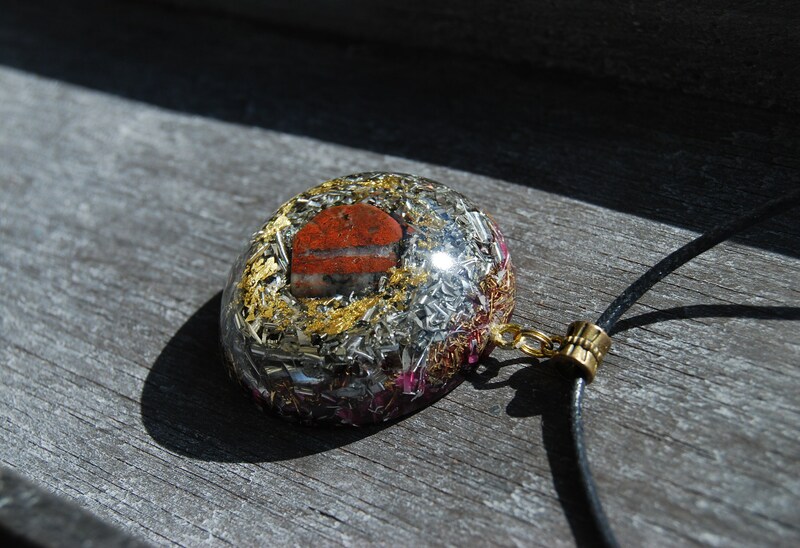 The main stone is a polished Brecci Jasper in the front. Furthermore it consists of Rose quartz (self love), Pyrite (to enhance and deflect extremely low frequencies), black Tourmaline (to protect and ground excess energy), Rhodizite (to amplify) and clear quartz (for piezo-electric effect) all within a durable resin setting. Brecciated Jasper is a stone of strength and vitality. It can be used to bring mental clarity and focus to a previously scattered event, experience or life in general. 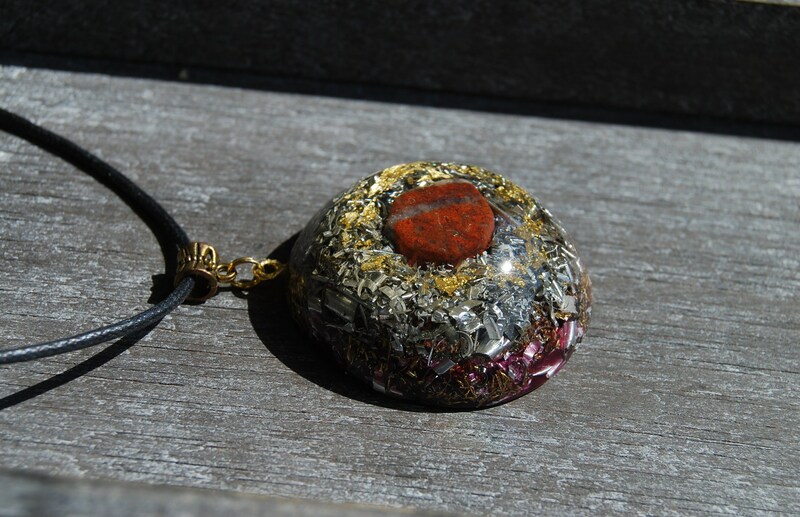 Brecciated Jasper stimulates the base and sacral chakras in addition to cleansing and stabilizing the auric field. 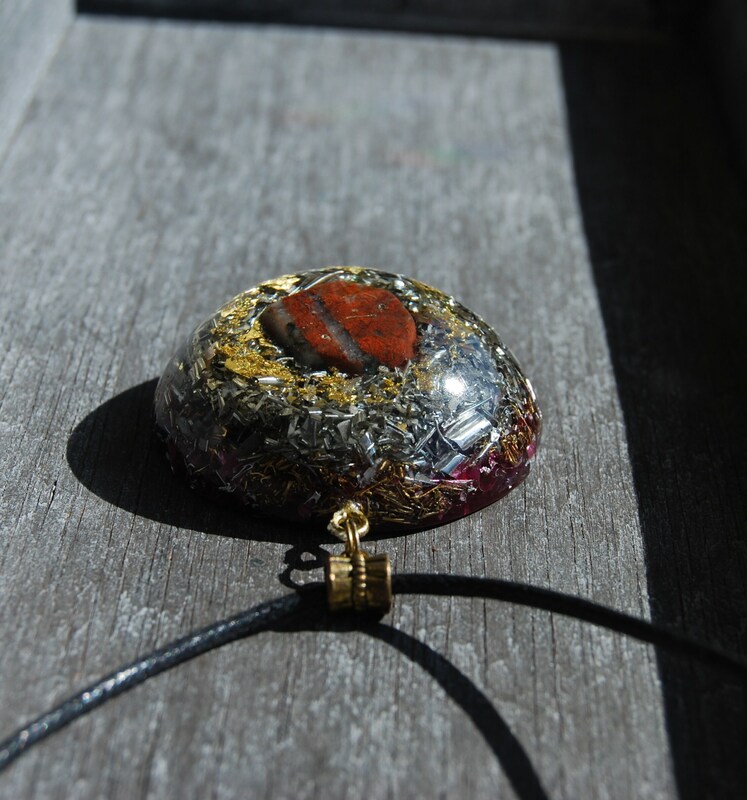 Brecciated Jasper removes negativity from any space, returning it to its original source. Brecciated Jasper is also used for overcoming sexual guilt or shame, can calm sexual aggressiveness as well as aiding in sexual compatibility. Use Brecciated Jasper as a worry stone to take advantage of its calming and nurturing properties. Brecciated Jasper also promotes dream recall. 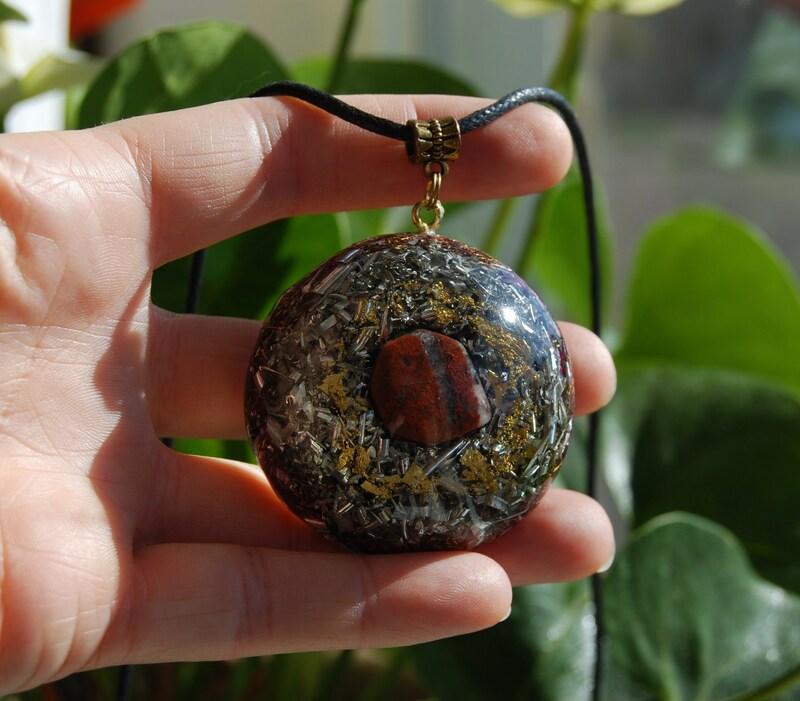 A detoxifying stone, Brecciated Jasper promotes health and healing/recovery from illness. Brecciated Jasper is a wonderful grounding stone which can assist those who feel overwhelmed when it comes to the task of organization. Brecciated Jasper can also help in developing creativity and finding adequate outlets for the expression of this creativity. 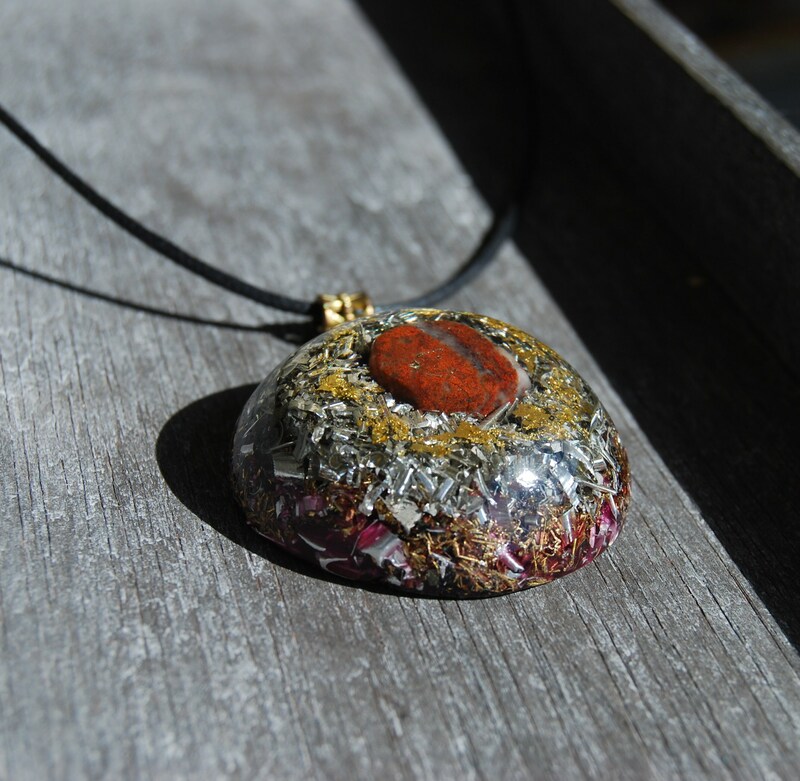 While it is said that Brecciated Jasper can stimulate the rise of the Kundalini, it has a tendency to add stability to this energy. In general, Jasper is known as the “supreme nurturer”. It sustains and supports during times of stress, and brings tranquility and wholeness. 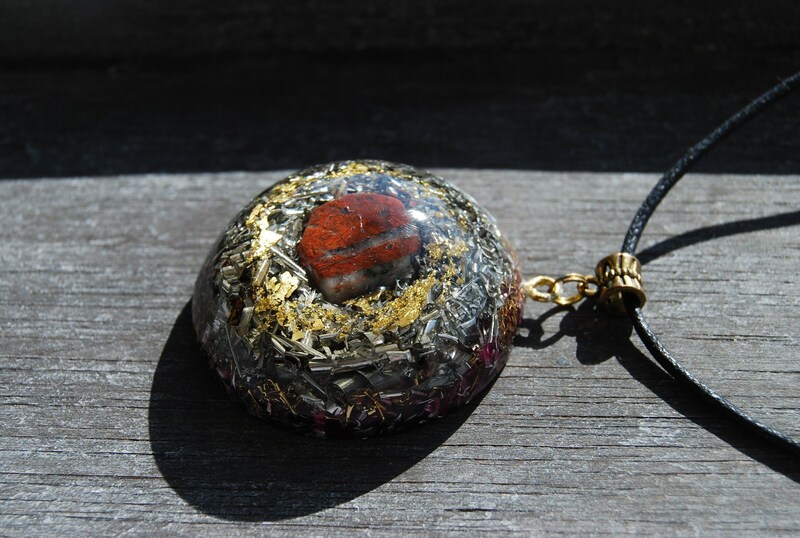 Used in healing, Jasper unifies all aspects of your life. Jasper reminds people to help each other. It has been hand sanded through 13 sets of fine polishing paper so it has a dome design and it is shiney and silky smooth.